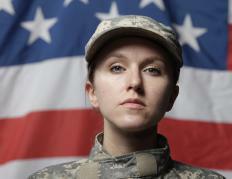 Each branch of the military has its own tuition assistance program. As a benefit to the men and women who serve in its armed forces, the United States government provides military Tuition Assistance (TA) programs. These programs help service members meet the costs of taking high school or college courses while off duty. There are different types of tuition assistance, and each program has specific guidelines and processes the applicant must follow. In some cases, a military tuition assistance program may pay 100 percent of college course costs for those who are eligible. In return, each recipient must continue on active duty for 24 months after completing TA-financed education. Military tuition assistance is not a loan, which means recipients do not have to pay it back. It is paid directly to the school in which the service member chooses to enroll. Each program has its own guidelines for assistance eligibility. The Air Force TA program is open to service members on active duty or in the reserves. The Army TA programs are available to those who are on active duty, some people in the reserves and Army National Guard recipients. The Marine TA program is restricted to those who are on active duty. The Coast Guard TA program, on the other hand, is available to those who are on active duty and in the Selected Reserve. It is also available to civilians who are Coast Guard employees. Though military tuition assistance may cover up to 100 percent of a recipient’s tuition and fees, there are certain restrictions set by each program. These restrictions include maximum amounts the program will pay in a given year and the maximum amount the program will pay for each credit. Each program may also choose to pay for different things. For example most military tuition assistance programs pay for tuition and fees related to labs, computer use and enrollment. The Coast Guard TA program, however, restricts its payment to tuition and lab fees. There are some things the military tuition assistance programs won’t cover. A service member will have to pay for college textbooks out of his own pocket or obtain financing elsewhere. It won’t cover tuition for someone who wants to obtain a lower degree. For example, if someone has a master’s degree, it won’t pay for him to earn a bachelor’s degree in another field. Likewise, if the recipient has a bachelor’s degree in biology, it won’t cover tuition costs for earning a lateral degree in engineering. Some other countries may provide assistance with educational costs as well. The United Kingdom Royal Navy, for example, will provide scholarship money to those who are in school and planning to join the Royal Navy later. In Canada, tuition subsidies may be available for those wishing to join the Canadian Forces after completing schooling. Active members of the Canadian Forces may be eligible for educational reimbursement programs that allow them to upgrade their education levels as well. How Did the Royal Navy Keep up Morale during Long Voyages? How do I Become a Coast Guard Pilot? What are the Different Types of Federal Tuition Assistance? What is a Subsidized Stafford Loan?